85 Degrees Today in Cleveland! I think most of us in Northeast Ohio saw this coming… from snow and freezing temperatures to sunny and 85 degrees! This weather pattern doesn’t surprise us Clevelanders! Now is the time to think about air conditioning. Whether it’s maintenance or repairs on your existing cooling system or adding air conditioning, call Verne & Ellsworth Hann. Verne & Ellsworth Hann has been servicing Cleveland Heights, Shaker Heights, University Heights, Beachwood, Lyndhurst and the surrounding area for over 63 years and has branched out into parts of Lake and Geauga counties as well. 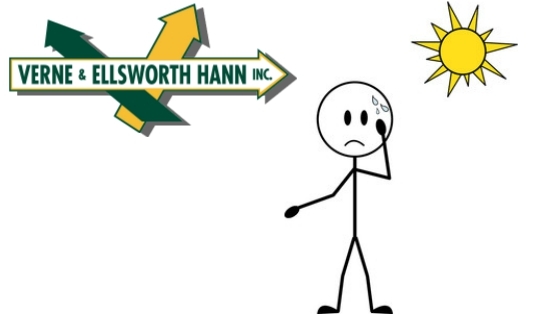 Verne & Ellsworth Hann has 5 generations of Hann Family members and is the ONLY Hann family owned HVAC company in Cleveland. Heat and humidity can make your home uncomfortable. Don’t suffer through summer because, whether we want to admit it or not after the miserable never-ending winter, no one likes to sweat in the comfort of their own home! Enjoy this warm 85 degree day here in Cleveland but make sure you have a cool, comfortable home to relax in at the end of the day!